In the present study, subcritical water was used for extraction of bioactive compounds of Symphytum officinale root. Temperature (120–200 °C), extraction time (10–30 min) and HCl concentration in extraction solvent (0–1.5%) were investigated as independent variables in order to obtain the optimal conditions for extraction and to maximize the yield of total phenols, flavonoids and antioxidant activity of obtained extracts. The application of optimal conditions (200 °C, 25.6 min and 0.0075%) provided extracts rich in total phenols and flavonoids and high antioxidant activity. 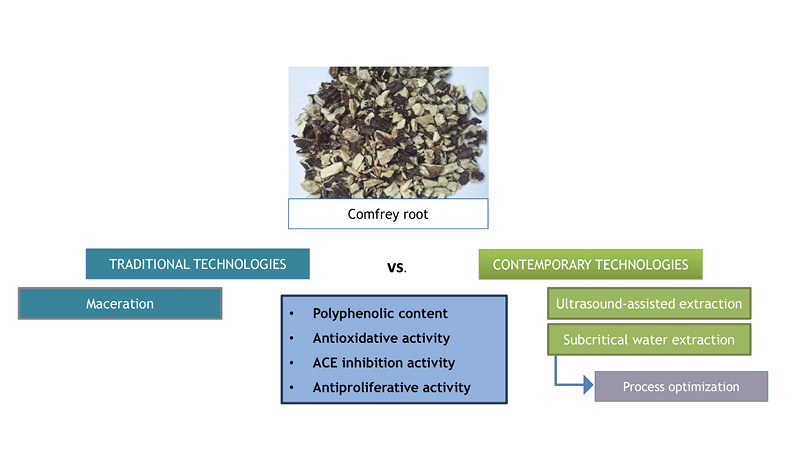 Results also demonstrated that subcritical water extraction showed significant advantages for recovery of comfrey root bioactive compounds comparing to maceration and ultrasound-assisted extraction techniques. In addition, subcritical water extracts of S. officinale root are the promising sources of compounds with antioxidant, ACE inhibition, and antiproliferative properties and could potentially be used for production of new pharmacologically-active formulations.